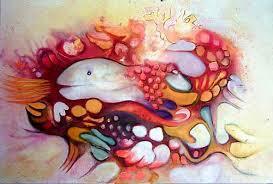 Abstract expressionism is a school of art that developed in the United States following World War II. It was the first major art movement native to the United States to create global impact in the art world and made New York an epicenter of art. Jackson Pollock (1912-1956) is perhaps the most famous and representative artist of abstract expressionism. Abstract expressionist artists find their predecessors in surrealism, which emphasized subconscious creation. Salvador Dali is the best-known surrealist. Jackson Pollock’s technique of dripping paint onto the canvas has this subconscious influence. Willem de Kooning (1904-1997), who moved to New York in the 1940s is another famous abstract expressionist artist, known for large abstraction paintings. De Kooning is famous for several series depicting women in abstraction. Other notable abstract expressionist artists include Willem’s wife Elaine de Kooning, Hans Hoffman, Adolph Gottlieb, and Mark Rothko. Rothko (1903-1970) is the third of the triumvirate along with Pollock and de Kooning. Rothko determined to abandon traditional inspiration from urban and nature scenes, and began using mythology as a comment on current history. The writing of German philosopher Friedrich Nietzsche also heavily influenced Rothko. Rothko developed a signature style known as “multiforms,” using symmetrical blocks of generally two or three opposing or contrasting colors. Allan D'Arcangelo research papers discuss the brilliant artist who is well known for his pop art. Paper Masters writes custom research papers on Abstract Expressionist Artists and discuss one of the first major art movements to create global impact in the art world.